The forerunner and master of the definitive ‘rock riff’. 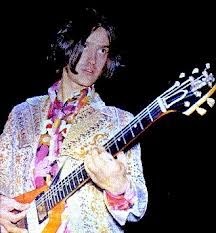 Dave Davies, famous guitarist of the Kinks and disseminator of iconic guitar lines that graced legendary songs like ‘You Really Got Me’, ‘All Day and All of the Night’ and ‘Til the End of the Day’, was also a revolutionary in his choice of instruments. Today in the ‘rock room’ we will examine one of the most recognizable of these guitars Davies’ 1959 Gibson Flying V. While the Flying V started to be produced in 1958, Davies is on record as saying his is was an early model prototype ,but has recently confirmed it is a 1959. I cannot confirm the exact production date. 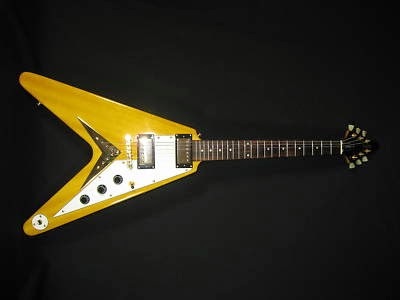 Currently these early Flying V’s can reach into the hundreds of thousands of dollars, due to their rarity and limited production. 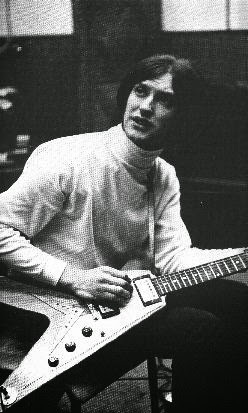 According to legend, Davies’ and the ‘Kinks’ arrived in America for their 1965 tour minus the guitar (a Guild) that Davies planned on using for the planned performances. Without an alternate guitar Davies and crew took to the American music shops to find a suitable replacement. According to Davies when he was unable to find a guitar that suited his needs a shop owner presented Davies with an original 1959 Flying V in an oddly shaped tattered carrying case. Davies was later quoted in an interview with Gary Owen that he paid 200.00 dollars for the instrument, the main attraction that he could ‘put his arm through the middle of it’. He later realized that the balance of the instrument was not realistic to his playing needs and thought more of its ‘fancy look’, calling it a piece of ‘visual art’. This makes perfect sense as the guitar was created during an era where space age design was applied to everything including vehicles and household products. The guitar was sleek and sharp and the perfect foil for the fashion forward and hip Davies. Oddly enough, the exposure that Davies’ gave the guitar over the course of the 1965 US tour cemented the instruments popularity for the duration of rock history. Davies was pictured on the television show ‘Shindig!’ playing the guitar and that was enough for garage band wanna-be’s and guitar heroes to look for the groovy and idiosyncratic instrument and to make it their own. This visibility encouraged Gibson to assemble a 1966 edition of the guitar which unfortunately did not sell as expected and by 1970 the guitar was no longer being made. In spite of the instruments lack of sales famous guitarists Jimi Hendrix, Keith Richards and blues man Albert King used their own respective Flying V’s throughout the 1960’s. By the mid to late 1970’s the instrument was back in production and being used by a host of musicians ranging from rock to metal. Davies guitar featured a solid body natural finish and was made from Korina wood and contained what I believe to be a Mahogany neck. The guitar also featured a string through body tailpiece in addition to two Gibson PAF humbucker pickups. Three dials for volume and tone control for each respective pickup as well as a switch for bridge/neck pickup choices are spotlighted on the lower part of the guitar and white pick guard. The tone of the guitar is classic Gibson with a heavy mid range attack. The guitar expresses a smooth but hearty round tone that slices through the surrounding supporting instruments. 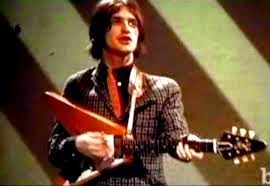 A definitive example of the guitar in action is on the Kinks track ‘Til the End of the Day’. 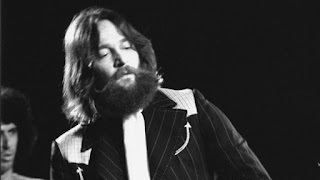 The guitar was also featured on various sessions and stages up to 1970 including the songs ‘Australia’ and ‘Yes Sir, No Sir’. According to Doug Hinman the guitar’s last on stage appearance was in September 1970. The guitar was later sold at auction in 1995 for 24,000 dollars to a new and probably very enthused owner. While Dave Davies’ 1959 Flying V is not like previous ‘Tools of the Trade’ features where the instrument is the musicians’ ‘go to’ tool; it is a guitar of great influence and importance in the Kinks history, as well as in the history of rock. The innovative design, punk aesthetic and unique woody tone were the perfect fit for the misfit guitarist Davies and the krazy Kinks.